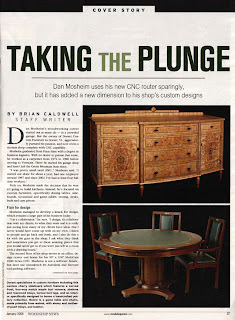 "This project was unique because the client wanted to recreate a table that he had seen 20 years ago and never forgot. 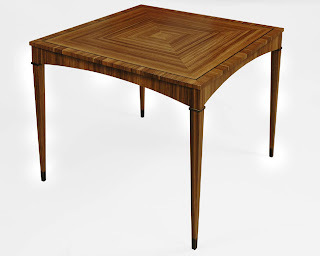 There were no photographs available - the table was designed from the client's memory, and, according to him, it turned out'better than the original'." It was a pleasure working with the client on this project and in a recent message I heard that the table was having some good karma for him. We also made a dining table and chairs for their dining room this year. Sam the Metalman from Dorset Custom Furniture made these four 'trophies' for the Annual Vew Do Rail Jam that took place at the Manchester, Vermont Applejack Field on December 29th. The event is open to snowboarders and skiers of all ages and all proceeds benefit the Manchester Rec Skateboard Park. 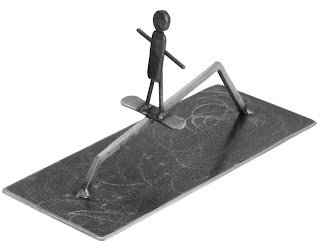 They're quick welded sculptures that truly capture the spirit of the event. 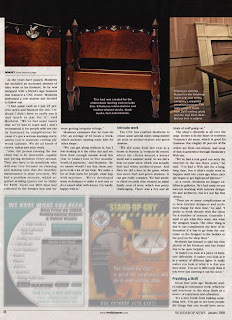 Dorset Custom Furniture Featured On The Cover of The Woodworkers "Rolling Stone"
Dorset Custom Furniture is featured on the cover of this January's (2008) Woodshop News. 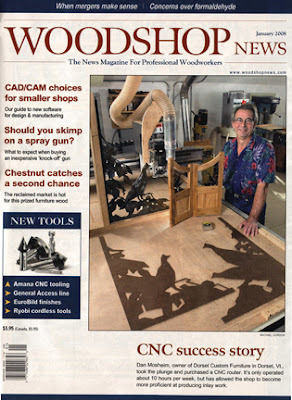 Woodshop News is a national magazine that bills itself as 'The News Magazine For Professional Woodworkers'. It is a nice, widely read trade magazine similar in size, shape and feel to the music magazine 'Rolling Stone', and we're very honored to have been selected for the cover story. 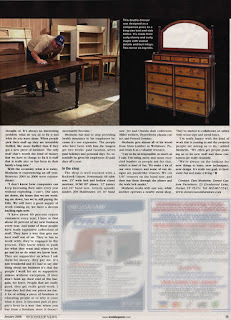 The article, written by Brian Caldwell, features a brief history of the business with a focus on our fairly recent purchase of a MultiCam CNC router. 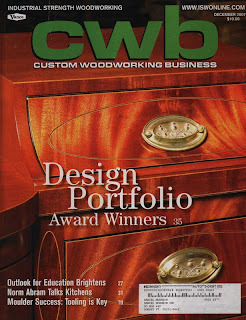 Woodshop News is available at many fine local building products stores. This is a continuation of an earlier post regarding mockups and models and shows the actual project in the process. 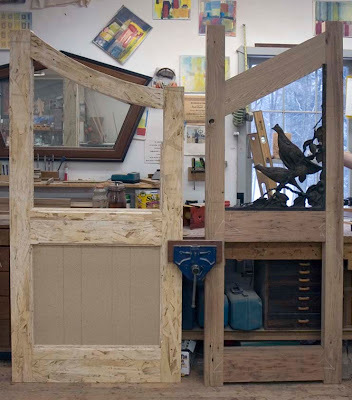 We're now working on the doors based on the decisions we made earlier, after viewing the full size mockup, to make the doors 'lighter' and narrower. 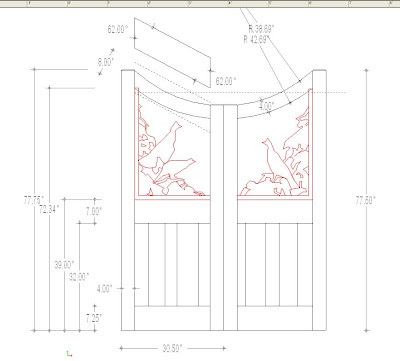 To the left is the modified cad drawing showing the new proportions. Jeremy has now completed the rough joinery and is now patching the obvious bad spots in the recycled chestnut that we're using to build them, then we'll add the decorative details to the stiles and rails and add the boards to close off the lower panel openings. These pieces all had their seperate design and execution complications, but in the end, they all came out well and all the complications were resolved. 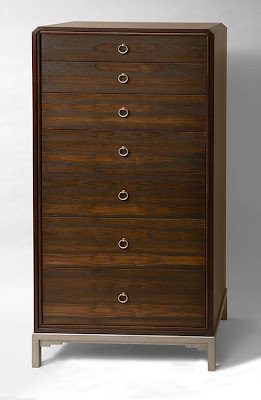 One of the nicest details is the angled tops of the wenge cases that are complemented by the recessed, round hickory moldings that set off the recessed again hickory doors and drawers. That stepping in feature led us on quite a hunt to find the proper hinges when we remembered that the client wanted mirrors on the insides of the doors. The low piece is two sided and only 32" deep so the drawers had to be fairly shallow. We ended up making the door cabinet shallow which allowed half of the drawers on one side to be deeper. The top is faux painted mdf for the photo and the piece will have an onyx top when it gets to NYC. 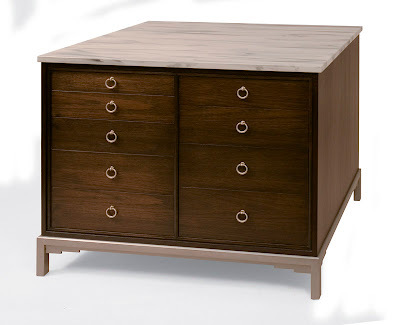 The tall chest was the most straight forward of the three, but selecting the veneers for a pleasing light/dark pattern involved some trial and error. 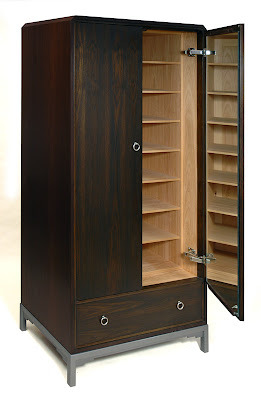 The armoire was just like the others, only bigger, heavier, and hair raising to get the two big veneered doors to lie in a plane and close correctly given the lack of case frame structure. Most of the work on these pieecs was done by Mark Granfors before he moved South. 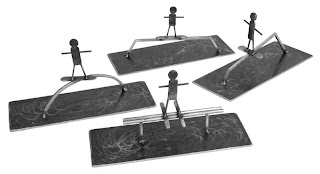 Finishing by Jeremy Russell, steel bases by Sam Mosheim and Jim Parsons. Teamwork, teamwork. 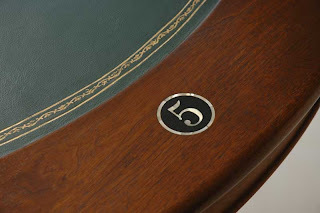 This week we finished up five pieces that have been in the works for quite a while. Four of them are for one client, and they will be delivered to New York City this week. 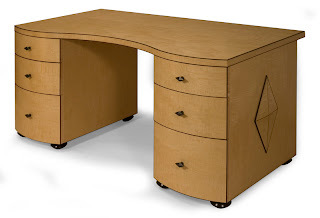 The desk was for other clients on Long Island and it will be delivered the week of the 17th. All were complex and challenging pieces involving veneers, custom fabricated metal work, both steel and brass, and complicated design details. 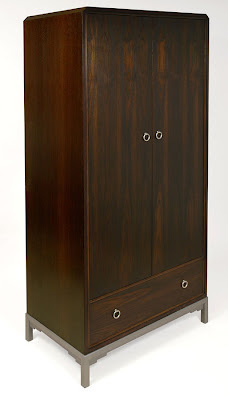 They are all, coincidentally, heavily influenced by the historic Art Deco Design Style. 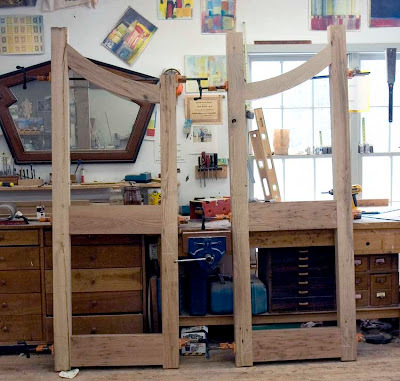 Three are fabricated from wenge, hickory and steel and will reside in the same room, the zebrawood table is for the same clients but will be in a different room and the curly maple desk is for a completely different, but also, long time client. 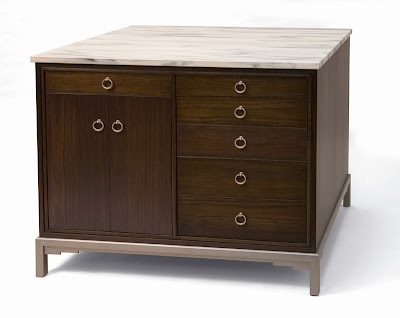 The desk is a design collaboration with the interior designer Judith Stutt of Weston, VT. 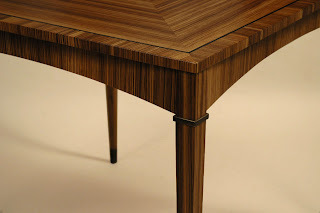 This zebrawood table posed all kinds of challenges, from resawing the veneers and selecting which ones to use where, the order of steps in the veneering process, fabricating and attaching the brass feet and little 3/8" moldings on the legs, the double curving veneered aprons, and matching the 'waterfall' veneers as they wrapped around the corners. 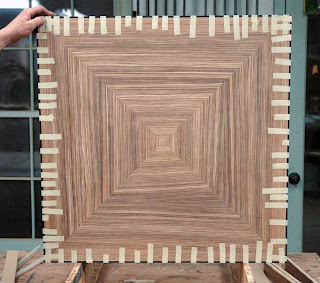 That last step invovlved cutting and labeling the veneers as they came off the flitch. Nicely executed by Jeremy Russell. 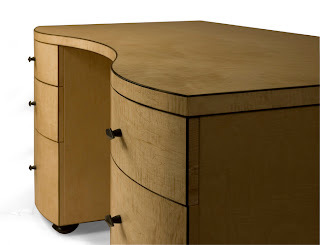 This desk had numerous challenges including working with thin curly maple veneer, multiple forms for the drawer boxes and fronts, jigs for cutting the ebony lines on the top and drawer face edges, the diamond shaped side inlays, the curved drawer box joinery, etc., etc. 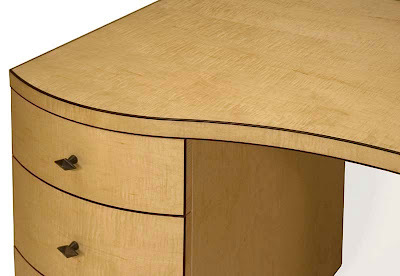 For the drawers, because the fronts were curved on a smallish raidus , we had to create a new joinery system as the short grain of the dovetails on the curved wood did not have enough integrity. 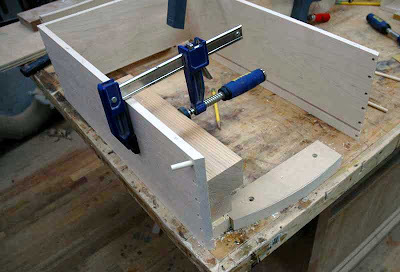 Mark came up with an angled dowel joint that was relatively easy to execute using a jig he made on the drill press. This joint proved to be very strong on our test pieces and while it's not our usual crispy dovetails, it's an attractive joint and in the long run, certainly as strong. 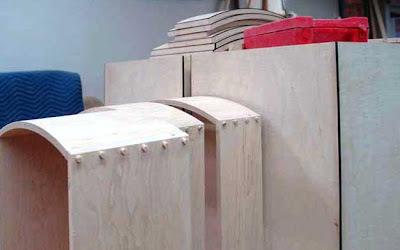 See pictures of this joinery process on the "Curved drawer front joint" post.